Everyone likes music. There's no exception. Be it Rock, Pop, Metal or Classical music. 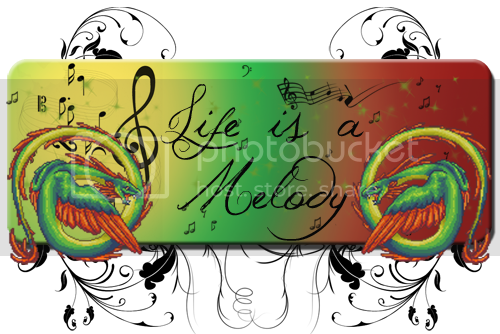 Music is colorful and multifaceted, just like life itself. Music can be scary, consolatory, it makes you happy and sometimes it can make you sad. Music is fun. Music reminds you of places you have been, people you have met as well as on the people you love or don't like. It reminds you of good and bad times. It accompanies you through your whole life and there is a song for every life situation. 1.) Follow the lineage rules please! What is special about this song? Why did you choose it? : This song always reminds me of the day I flew to America for the first time. Last edited by Drachenschwinge on April 6th, 2012, 4:18:15 am, edited 36 times in total. Here I will list all songs that are already taken The official "Lineage-Playlist"
Only Hope - Mandy Moore https://www.youtube.com/watch?v=i0_OJqd ... _embedded#! Last edited by Drachenschwinge on November 7th, 2011, 8:03:56 am, edited 6 times in total. Finally I found this one! What is special about this song? Why did you choose it? : I LOVE this song. This is the first folk metal band I ever started to listen to and I was turned onto them by my boyfriend. Plus the song translated means 'Hands as their Wings'. It's kind of the opposite with Quets. They have wings, not hands. Location: Gifting people candy for halloween and hoping I get some of the chocolate lizards as gifts.